Quite a serene little hideaway - someday! Tucked between the rear of the grange, the side of the pigeonnier and the backs of the barns is our little courtyard. It will be, when we've finished a serene afternoon hideaway filled with dappled light and warmed by the sun. Dominating the centre of the courtyard are a large bay and an ancient gnarled quince tree. Renovations here will be simple as there's very little to do besides demolish the old animal housing (chicken coops and rabbit hutches) and to plant out the garden. We do have designs on a giant stone water trough but right now are short on ideas on how to move it here! 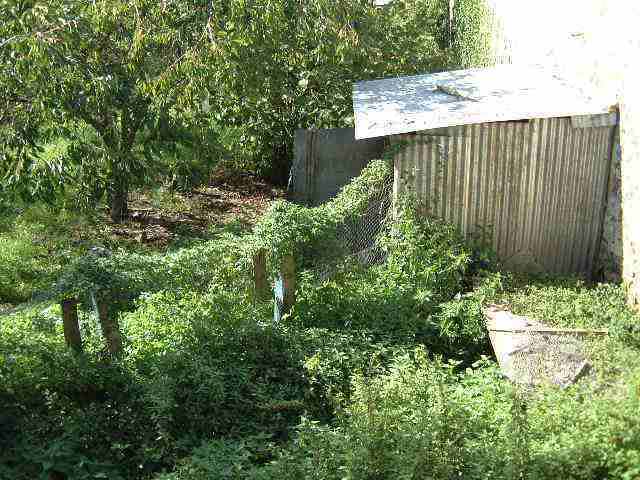 Here's a snap of the courtyard (and a chicken coop) from the first floor of the main centre barn - the overgrowth of nettles was so harsh that we were unable to walk through the courtyard when we first visited. Here's Mr Foden senior sorting the chicken coop out with the judicious application of an angle grinder!